White porcelain, made from a mixture of clay and crushed rock fired at a very high temperature, was first produced in Korea in the Koryo dynasty (918–1392) and came to dominate ceramic production in the Choson dynasty (1392–1910). Kilns produced large objects for use at court as well as smaller domestic pieces for private customers. In about 1800 they began to produce elegant white openwork porcelain objects such as this brush pot. Painting and calligraphy were essential accomplishments of the Choson gentleman, and this piece would have graced a scholar's study, serving its function but also delighting the eye. Plain white wares, with their connotations of purity and honesty, were particularly popular in a culture embedded in Confucian philosophy. The bluish tinge of the glaze of this pot is a typical feature of Korean porcelains and becomes all the more pronounced if the glaze is thickly applied. 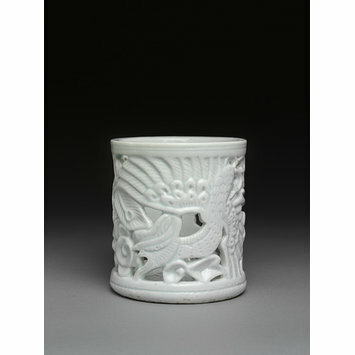 Korean art abounds in symbolism: the design of phoenixes on this piece was associated with longevity and good fortune. 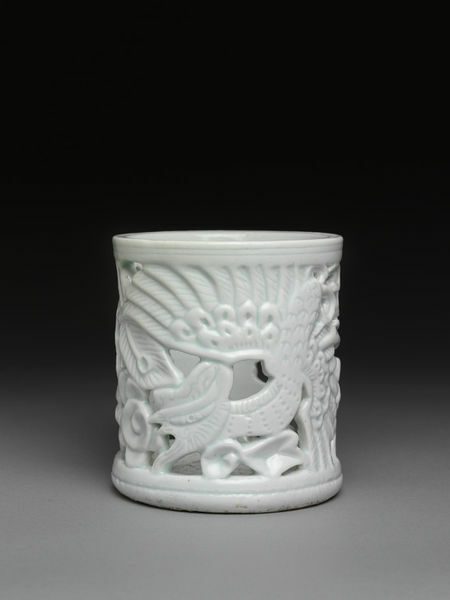 The brush pot features openwork decoration of two phoenixes with outspread and upswept wings. They are surrounded by leaf and scroll-like foliage. Birds, Bats & Butterflies in Korean Art. Liz Wilkinson. London: Sun Tree Publishing, Singapore, 1996. Korean Art and Design. Beth McKillop. London: V&A, 1992.